One of the most interesting movie projects to be uncovered during the massive Sony hack in late 2014 was a movie that eventually came to be known as MIB 23, a crossover of the Men in Black and Jump Street franchises. 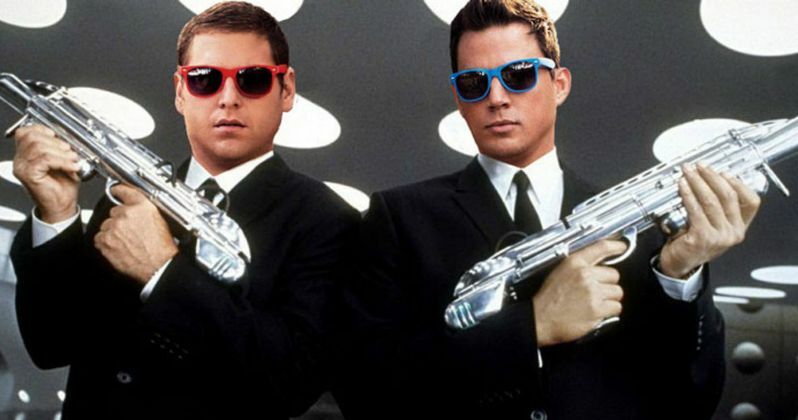 Both Channing Tatum and Jonah Hill were said to return as Jenko and Schmidt, with two younger actors replacing Will Smith and Tommy Lee Jones as J and K. Earlier this year, it seemed like the movie may actually happen, but, according to Jonah Hill, that may not be the case. Sony Pictures made this long-rumored project official during their CinemaCon presentation in April, and then in May, we reported that The Muppets filmmaker James Bobin has come aboard to direct. We haven't heard anything about the project since then, but during an interview with Toronto Sun for his new movie War Dogs, Jonah Hill expressed doubt that MIB 23 will ever actually happen. "I had the idea. But I doubt that movie will get made. It's too complicated. They're trying to make all the deals, but it's kind of impossible with all the Men in Black stuff. The Jump Street films were so fun to make and the whole joke of them was they were making fun of remakes and sequels and reboots and then now it's become a giant sequel, reboot. It's almost become what we were making fun of and it's hard to maintain that joke when it's so high stakes. I love Channing and I love (directors) Phil Lord and Chris Miller and I love making those movies - they're a lot of fun. So I hope it works out." Phil Lord and Chris Miller, who directed both 21 Jump Street and 22 Jump Street, handed over the directorial reins to James Bobin because they're currently occupied with Disney's Han Solo: A Star Wars Story spinoff, which is set for release in May 2018. The filmmakers are still on board as producers, alongside Neal H. Moritz, but as of now, this crossover project doesn't have a release date, and we don't know if there is any production schedule in place. Last April, Phil Lord and Chris Miller claimed that all of the fake sequels revealed at the end of 22 Jump Street would be canon, and would be implemented into the actual sequel. Rodney Rothman, who wrote 22 Jump Street, is writing the script for MIB 23, which was reportedly met with praise by the studio, although no official plot details have been revealed. Sony is also developing a separate reboot trilogy, which won't feature any of the original stars, but it isn't known if those films will be connected to MIB 23. We'll be sure to keep you posted with more updates on MIB 23 as soon as we have them.